So Egypt won the big game verses Algeria 2-0, in a World Cup qualifier, The two teams will play again Wednesday in Sudan. The winner will go to the World Cup in South Africa next year. I'm not a big sports fan and to be honest most soccer games put me to sleep, but the big games like this one are fun to watch and participate in the celebration. 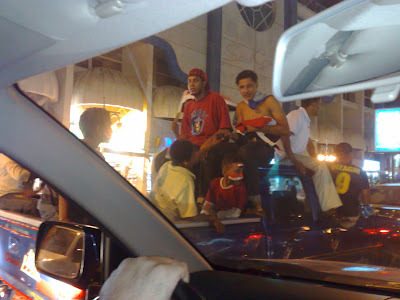 After the win we went driving through the main street in Hurghada. There was such a wonderful feeling of joy in the streets. Everyone was out and happy. 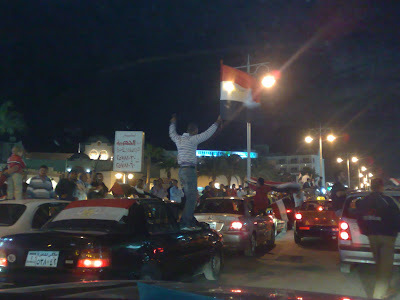 People were standing on top of everything, hanging out of cars, honking in rhythm and cheering "Masr" (Egypt). Tourists got in on the fun too! I loved seeing all the red/black/white hijabi outfits! It was a blast. We went and got ice cream and came home. It really makes people happy, winning soccer games, and I think that's great, but to watch all the songs and tributes on TV you'd think this meant Egypt is just so wonderful in every way, when really all it means is that the Egyptian soccer team plays well. I don't say this to be a downer, really, in the end, patriotism is a good thing, whatever the reason, I suppose. Oh no Mona.... you too??? LOL.... great pics of the action but I gotta be honest, I was hoping they would lose!!! Of course, every Egyotian should be proud to be the winner but they took 1/10 of the energy and pride they have for soccer and use it towards trying to make their country a better place, it would be "all good"... do you know what I mean? Ha...Slovenia played with Russia today and we lost :(!Anyway,life goes on! Anisa, I know what you mean, it's true. I've got Egyptian blood, whatdya expect? 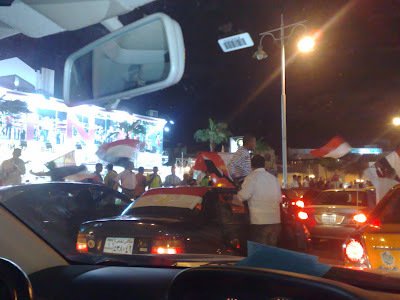 Thanks for sharing the excitement in Egypt. 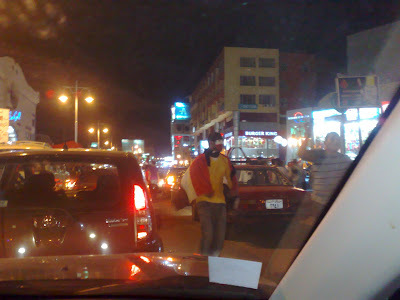 A lot of my friends on Facebook were watching the game, so its cool to see how excited everyone actually was in Masr. Yay! I'm not much into sports either but sounds like everyone had fun celebrating! Congratulations Mona, it was a good and exciting game! I'm not a football fan but when it comes to world cups and qualifiers I love following it. 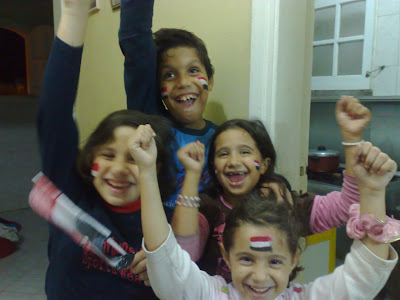 There are a few non-egyptians here in the flats but even they were really excited and happy for egypt. And this is a good, nice thing for Egyptians. It's great to have something to be proud of. Had to share my cheers too since I'm egyptian too. I like listening to all the songs , cheers and " hesaa" they do out in the streets. LOL. Hagah Gameeilah, Ha, hessa is what it's all about!